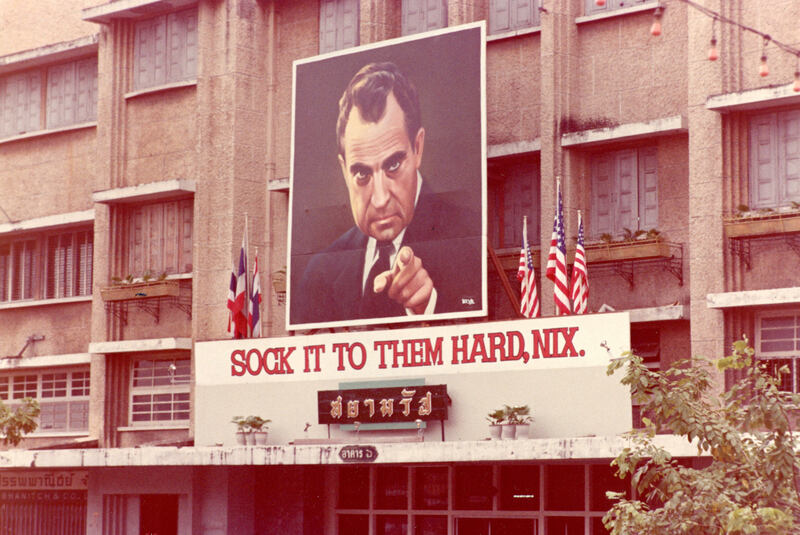 Photo of a sign with the anti-Communist message “Sock it to then hard, Nixon” taken from a motorcade in the streets of Bangkok, Thailand during President Nixon’s visit on July 28, 1969. (Richard Nixon Presidential Library). Kantathi Suphamongkhon is the former Foreign Minister of the Kingdom of Thailand. What were the United States’ relations with Thailand during the Nixon administration? On this edition of the Nixon Now Podcast we are joined by Kantathi Suphamongkhon, the former Foreign Minister of the Kingdom of Thailand. Dr. Suphamongkhon is a regents professor at his alma mater, the University fo California, Los Angeles, a senior fellow for international relations at the Burkle Center at UCLA, and a director of the advisory board of the Center for Asia Pacific Policy at the RAND corporation. Jonathan Movoydis: Welcome to the “Nixon Now” Podcast, I’m Jonathan Movroydis. What were the United States’ relations with Thailand during the Nixon administration? Here with us to discuss this on this edition of the “Nixon Now” Podcast is Kantathi Suphamongkhon, the former foreign minister of the Kingdom of Thailand. Dr. Suphamongkhon is a regents professor at his alma mater, the University fo California, Los Angeles, a senior fellow for international relations at the Burkle Center also at UCLA, and a director of the advisory board of the Center for Asia Pacific Policy at the RAND corporation. Dr. Suphamongkhon welcome. Kantathi Suphamongkhon: It’s my pleasure. Thank you. Jonathan Movoydis: Just to kinda go into it, I heard that you got your inspiration for your career through association with President Richard Nixon. Could you tell us a little bit about that? Kantathi Suphamongkhon: Yes. In fact, I was a student at one time, at UCLA and I was pursuing a pre-med education at the time. And so my experience at UCLA had been very good but UCLA was quite close to San Clemente. And I had this deep feeling of sympathy to President Nixon. That was not long after he resigned. So, I felt compelled to give him a message that even though he had a lot of difficulties through the Watergate situation, and he had resigned, and he became ill after his resignation. I wanted to convey a message that even a student at UCLA, an undergraduate student doing biology at the time, was rather grateful for what he did for Thailand, for US relations with Thailand, as I was a student from Thailand. And so, I decided to try to get his address so that I could write to him but it was quite difficult as a student to get the proper address I thought that the letter with really reach his hands. So, I decided to take the exit from the freeway between San Diego and Los Angeles and dropped into San Clemente and hunted a little bit for his residence. I knew it was Casa Pacifica in San Clemente. Didn’t know the exact address. So, I drove and eventually saw this sign indicating that it was the US Coast Guard Station with number. And I went up to the gate and I noticed that there was a telecom that I could pick up and it was rather scary because that was it, Coast Guard, US Coast Guard Station, and a telecom. So, I picked that up and I said, “I just want to ensure that a letter gets to President Nixon and would be grateful if you could give me the exact mailing address that would ensure delivery.” So, the person asked me to wait for a few minutes and he came back and gave me a proper address. So, I went back and I wrote to him and I actually kept it a secret from my parents. My father at the time was the Thai Ambassador in London to the Court of St. James or to the United Kingdom. I kept it a secret because I didn’t want to get embarrassed by expecting a reply from President Nixon and nothing would come, I thought. So, I decided, well, keep it a secret and maybe nothing would happen but what I didn’t do in the letter was to give my phone number. I thought someone might call and say, thank you and that would have been it. But I wanted some evidence and I thought maybe I would get a letter back. In the letter, I indicated my thoughts about US policy under him towards Thailand and was happy about that and try to in my own small way give some words of encouragement to someone who has had major challenges and of course the fall from grace as we know. So weeks passed by, nothing happened. But after the end of the third week, I saw a letter with no stamp but on the right hand side, upper right hand side of the envelope where normally you would have stamps, I saw a signature. And I remember being told years earlier that in the US if you have become president, you get this privilege in life, you don’t have to put a stamp, you just have to sign your signature on the envelope. So I thought, “Oh God. Oh that must be from President Nixon.” So, I opened up the letter, it was his signature at the upper right hand corner of the envelope but the letter was not from him. It was from Colonel Brennan at the time, his assistant. And Colonel Brennan thanked me for the letter and said that because I didn’t include the phone number in my letter, they decided to write back and to say that President Nixon would like to find a mutually convenient time for me to visit him. And in fact, I was told also that he hadn’t really seen anyone except for his close friends and relatives after his resignation. So, I would have been the first from the outside to be able to visit him. So, immediately I said, you know, “I would be ready anytime he’s ready.” So, we set the appointment up a week ahead and I thought to myself, “Okay, now I can tell my parents.” I called my parents up. My father was quite confused. I said, “Oh, I’ve been invited to visit President Nixon.” And my father was not even thinking of that and kept on saying, “Nick who? Nick who?” And I said, “President Nixon” and he said, “The embassy, the Thai Embassy in Washington couldn’t have arranged that for you. I mean, it’s very difficult.” And I said, “No, I didn’t ask the embassy to do it. I did it myself.” And he was quite shocked but was quite happy about it. My mother was very happy about it and I thought, “Okay, I must bring a gift” and I thought, “What would be an appropriate gift.” I assumed it had to from Thailand and I didn’t have any gifts from Thailand worthy of a President in my house at the time as a student. So, I thought, “Okay, I’d go to Thai town.” And I eventually found a statue of a very traditional Thai statue. So, I decided to purchase that and then I went down to see him. When I arrived I was then taken into an office where there were many secretaries and I was standing in the middle of the office, not knowing what to expect next. And suddenly the doors opened and President Nixon came out and walked towards me and greeted me as if he was like an uncle of mine. Very warm greetings and invited me into his office. And the first thing I saw in his office, of course, were the flags, so many flags. And I always, myself, was fascinated by flags but I’m glad I shared that interest for flags with him. So, and we talked for probably about nearly two hours. He opened up to me, he shared with me his nervousness during the night before he met the Soviet leader Leonid Brezhnev. We had a very interesting discussion from how many countries we have both been to in the world to serious policy issues and he then said to me, “Please remember that life is nothing without challenges.” And I thought to myself, “Well, that is a healthy philosophy for him to emphasize.” Life is nothing without challenges because he certainly had his share of challenges. And the other thing he mentioned to me was that in life, you must make sure that you don’t blend into the walls. And I thought that was also a good reflection of his life. He never blended into the walls. He always stood out and he had his charisma. Throughout our conversation, he started bringing up his observation that I would be a great diplomat, if I wanted to pursue that route. And I told him that I was actually doing pre-med but deep inside I was interested in diplomacy but my father wanted me to pursue other paths. And throughout our conversation he kept on coming back to say that, “No, I really think you should pursue a career in diplomacy.” He said that about six times during the two hours and he then took me for a walk on the beach. And we had a nice walk, eventually ended back in his office and he said again before I departed that I should consider a career in diplomacy for Thailand. After I said goodbye to him, I drove back and thought about it quite a lot for that one-and-a-half-hour drive back to Los Angeles. It was a Sunday and I remember that Monday I went into UCLA and I said, “I’m changing my major to political science.” And that started me on the path that eventually led me to diplomacy and to eventually become the foreign minister of Thailand. Jonathan Movoydis: It’s a very interesting story especially given the face to face contact with President Nixon and obviously very, very inspirational for you and what caused you to embark on a diplomatic career. Did you study at all his Asia policy in your career and college? Kantathi Suphamongkhon: I did. But before I go to that area, let me just say that we kept in touch and he actually would send me his books autographed every time he finished a book until he passed away. And the following year, my father visited me from London and I took my father down to see him too. So, we had another meeting. It didn’t last as long. It was more businesslike meeting but it was nevertheless very memorable for our family. And again, he never forgot. He would always send me his books. And regarding his policy towards Asia, of course, it was something that was in parallel with what Thailand did. Thailand was firmly on the US side since the end of the Second World War. Thailand had been at the forefront in being anti-communist. We actually contributed troops to Vietnam, we were a member of the Southeast Asia Treaty Organization, SEATO. And by the way SEATO was close to our family too because my father at one point in his career was the Secretary General of SEATO. SEATO interestingly, with the name Southeast Asia Treaty Organization, only had two countries from Southeast Asia, Thailand and the Philippines. After that, we ended up opening up to China right after President Nixon’s visit to China. So, we were moving along in the same directions, our two countries. And this year, incidentally, we are celebrating the 200th anniversary of Thailand US relationship starting in a sense of a first visit of an American citizen to Thailand about 200 years ago. So, this is another special year. Of course it’s 2018 and it does mark the 200-year anniversary of a good friendship between countries so far apart distance wise. Jonathan Movoydis: Generally, what was the US relations with Thailand during the Cold War? Specifically, in 1966 there’s a treaty signed called the Treaty of Amity. Could you kind of paint us the overall picture? Kantathi Suphamongkhon: The relationship would go back, if we’re talking about the Cold War, I would go back to the Manila Pact. The Manila Pact was the agreement that actually created SEATO. And because of the Manila Pact, Thailand became officially a US military ally. With the Manila Pact, we actually worked very closely together with the US on protecting the non-communist parts of Southeast Asia. Of course, we have heard a lot about NATO and Article 5, I believe. Which says that an attack on one is an attacked on all other members of NATO and all others would react accordingly. Meaning that all others would use force to help the country under attack. With SEATO, it was designed to be something a bit less clear. So, we had an agreement under SEATO that an attack on one member of SEATO would obligate all other members to consult together immediately. So, that was a distinction. And as you can see it, it was a bit weaker than the commitment towards NATO. And eventually, because SEATO itself was not really containing more than just two members, two countries from Southeast Asia that also became a level of problematic. And it then ended itself. And once SEATO has more or less decreased in its relevance, the Association of Southeast Asian Nations or ASEAN, came into being. And that was a real home grown organization initiated by the non-communists’ nations in Southeast Asia. The Treaty of Amity and Economic Relations between Thailand and the US came about in 1966. And that actually reflected the closeness of our two countries. Among other things, it gave US companies, US corporation national treatment in Thailand. So, US corporations had a major advantage over other foreign corporations in Thailand. Other foreign corporations would have to follow the international rules for trade in what was known as the most favored nations policy or practice. But US companies under the Treaty of Amity has what we would call national treatment, which meant that it had the same rights in many sectors of our economy as if it was a Thai company. So, that was very special and it also encouraged economic cooperation. Jonathan Movoydis: Our guest today was Kantathi Suphamongkhon, the former foreign minister of the Kingdom of Thailand. He talked about his acquaintance with President Nixon and US-Thailand relations in the Cold War. Please check back for future podcasts at nixonfoundation.org or on iTunes, SoundCloud, and Spotify. This is Jonathan Movroydis signing off.